You will start on the Subscription tab. Read on below to learn more about the different sections under this tab. You can also switch to the Contact Info tab to update the member's contact details, add a note, and add a flag. This page provides a quick overview. Click here for more details. When is the member's next scheduled delivery day? What payment plan is the member assigned to? Does the member have a store order for their next delivery? Does a member have any vacation holds coming up? Click here for an in-depth description of all fields in the Details section. When looking through this information, try to imagine a question that the information might help to answer. This can help put you in a critical mindset when trying to read through a lot of content! 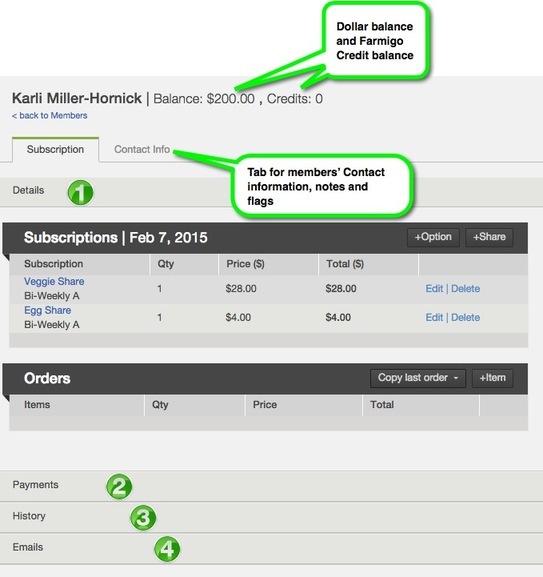 Payments will be automatically recording in this section according to members' payment plan. Click here for more information on when a member gets automatically charged. Check out this help page for a more in-depth discussion of tracking debits and credits using the member's History section. The email tab is the secret weapon to uncovering a member's past! The automatic responses that are sent out by the system, such as the Web Order Confirmation or Pickup Site Change Request, are only sent when a member takes that action through their account. If an admin makes a change in the system, you will not see that one of these emails was triggered. Click here to learn more about how to edit the emails that a member receives.